This is mainly me just introducing myself and “Ramblin’ With a Camera.” Check it out to see the sweet intro that’s going to carry over into my other blogs and to see some photos of my Loyola Experience! This Thursday, we celebrate another Thanksgiving. For many, it’s a day comprised of good food, family and friends, football, and the kick-off to the holiday season. More importantly, it’s a day where we are able to reflect on our lives and of course, think about those less fortunate. Personally, I want to say “THANK YOU” to the many admission staff members, student workers, and ambassadors who go above and beyond their required responsibilities each day. Your hard work is appreciated! P.S. : Please don’t forget that if you are applying to Loyola for Fall 2014 as a freshman student, the priority application deadline is this coming Sunday, December 1. APPLY NOW! On November 9 and 16, Loyola hosted high school juniors and seniors as well as transfer students for our annual open houses. Students and their families came from all around the Chicago area, across the state, and from many states outside of Illinois. We welcomed more than 2,100 students and approximately 3,800 family members. It was an exciting and busy two days on campus! It was great to see so many students interested in the Loyola Experience. Our faculty and staff were very excited to talk with members of the Class of 2018 and beyond! One of my favorite things about attending a Jesuit institution is it’s important value, “service to others.” It seems like there are infinite volunteer opportunities at Loyola, whether they be posted online or posted on bulletin boards throughout the many buildings. Volunteering has always been a huge part of my life, so I was excited Loyola had so many great opportunities. One of the first organizations I became involved in at Loyola was Loyola4Chicago. Loyola4Chicago is a program that recruits students to perform weekly volunteer services at a number of different sites. These sites include Big Brothers Big Sisters, volunteering at homeless shelters, and volunteering at a home for people with developmental disabilities, to name a few. My freshman year, I volunteered at a school that had an afterschool program called Teen REACH. I offered homework help as well as assisted in different life skills enrichment activities. My sophomore year I volunteered at Misericoridia, which is a home for people with developmental disabilities. I would hang out with the residents and help them to knit or work on different art projects. Both experiences were incredibly rewarding, and I am grateful that I was able to help those in need. There are numerous other volunteer opportunities available through Loyola. One way to find out about these opportunities is to search on RamblerLink; RamblerLink is Loyola’s online job, internship, and volunteer database. Another way is to navigate through Loyola’s Center for Service and Action website. This website lists ongoing volunteer projects as well as one time volunteer projects. The opportunities to volunteer in the city of Chicago are endless, whether it be volunteering at an animal shelter, volunteering with kids, or volunteering with people with developmental disabilities. I am so thankful I attend an organization that values service as much as I do! Check your Applicant Status page and send in any missing documents by December 1st, our priority deadline. (Loyola requires one letter of recommendation, one writing sample, all high school transcripts, and either ACT or SAT test scores). If you have recently sent in documents, give us some time to upload & process them (this can take up to two weeks), so if they’re not on your applicant status page instantly, be patient. Visit Campus! 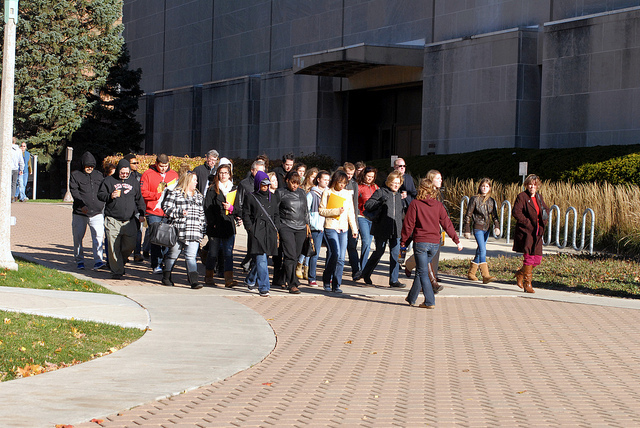 We had nearly 2,500 students visit Loyola the past two weekend for our Open House. If you missed the event, you can still visit Monday – Saturday. Click here to register for a Campus Visit! Start searching for additional scholarship opportunities. There are many opportunities at Loyola and from outside sources. Be Patient! Admission Counselors are reading hundreds of applications per week. We’re just as anxious to send out decisions as you are to receive them! Do be sure to check you Applicant Status Page daily, as this will be the first place your decision is posted. We will also be mailing out acceptance packets, but this will typically take a few additional days. I could sense the grin on her face. She shared that she was admitted to Ole Miss and how it was so nice to know that she ‘got in’ to at least one school. She knew other decisions would be arriving later, but she was excited that this was the first college she had heard from. She planned on setting up a campus visit soon. I might get a text message or a message sent via Facebook, but this was a phone call from my niece. I love hearing from her and learning how she is doing. She knows what I do for a living and how I have been excited for her to start this process. She thought enough at the time to share her first admission letter with me. After 20 years in college admission, I can honestly say that it is still a thrill to hear the excitement in a student’s voice when they get admitted to a college/university. Hopefully, my niece will share the rest of the decisions as well as her impressions from her campus visits. I am sure our discussions over the holidays will be quite lively. Hopefully you have similar discussions as well! In light of the recent typhoon in the Philippines, UNICEF of Loyola decided to donate the proceeds of Loyola’s Best Dance Crew to crisis relief. The storm was considered one of the strongest on record, leaving a massive path of destruction in its wake and an estimated 10,000 deaths. UNICEF is working globally to provide immediate relief to those affected. Our chapter at Loyola quickly agreed that our event should benefit these victims. The event was a smashing success, and we managed to raise almost $800 towards the cause. I am humbled by the continued support of the Loyola community, and thankful to all those involved in making this event so amazing. A special congrats to the first place winners – Loyola’s IRISH DANCE! Their Irish jig was more than deserving of first place. 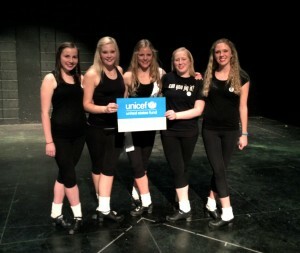 Keep a look out for more UNICEF events on campus! You won’t be sorry! As a senior in college you begin to cherish the time that you still have as an undergrad. My roommates and I realize that we may be living in completely separate parts of the country at this time next year. This has helped us to use our time wisely and do really fun things. One of the fun things that we decided to do this fall was have a “Moms Weekend”. So we all invited our moms out to Chicago to spend the weekend together playing games, shopping, and eating. For most of the weekend we kept our schedules open and played everything by ear. However the one thing that we did plan was a Paint Nite. This is a two hour long event during which we arrived at a local bar (the event travels to a different bar each night), and were provided with a blank canvas, paint, brushes, and an instructor. 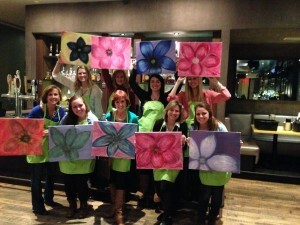 The painting for the night was of big flower and essentially we were all expected to paint the same flower. As you can see from the picture below, we had some rebels in our group and our flowers turned out to be pretty different from each others. It was such a fun event and the rest of the weekend followed suit. We went out to dinner, went shopping, and played a lot of games in our apartment. Sadly the weekend had to come to an end and it is once again Sunday. Surprisingly there is only two and a half weeks until Thanksgiving break, and then only once week until finals week! Time flies when you’re having fun! It’s hard to believe that graduation is just around the corner. This first semester of senior year is flying by, and I have been forced to think about my options after graduation. That means applications, and that means a personal statement. Most graduate schools require personal statements in their applications processes. Though it is only two typewritten pages, it has proven to be a daunting task to complete. As a law school applicant, I am supposed to write why I want to go to law school and why that will help me achieve my life goals. I have to place all my passions and motivations, my determinations and my goals, all in two short pages. Yikes. I am an English major, so writing is nothing new. I’ve probably written hundreds of pages in papers and essays in college, so the writing itself is not the difficult part. It is evaluating my life and putting it into words that has me stumped. Which parts of my life should I include, and where’s the line between professional and too personal? Luckily, Loyola has plenty of resources available to help me out. The Writing Center is conveniently located in the IC and assists students in all things writing. Undergraduate and graduate tutors are available for one-on-one tutoring sessions to help in any stage of the writing process. I’ve made an appointment for later this week, so hopefully someone in the Writing Center will have some idea how to translate my thoughts into words. There are countless other resources available to Loyola students. A good place to start is talking to your advisor. The advising office is always ready to answer questions and offer support. When your future in graduate school feels like it depends on two typewritten pages, it’s a relief to know there are people to help. Hundreds of students and parents visited Loyola this weekend for Loyola’s Open House. Groups were given tours of Loyola’s campus and were able to talk to faculty, students, and alumni about various programs that Loyola has to offer. Loyola will host another open house on November 16.